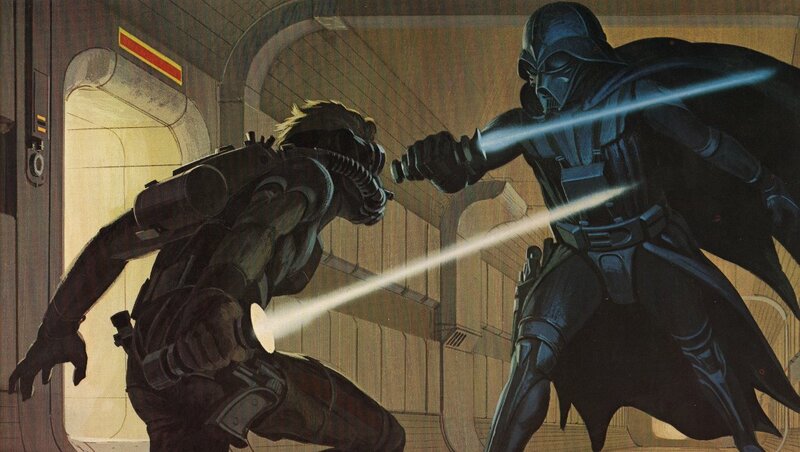 Luke is fighting Darth Vader in what was to have been a scuffle aboard the Rebel Blockade Runner soon after Vader's Imerial captured the Rebel ship. Luke is wearing a king of breathing mask because Vader's troopers apparently cut through a panel to get in, allowing the air supply to escape. The Darth Vader costume - a grotesque breath mask and all sorts of other lifesupporting systems, computer readout, black cape and armor - was partly inspired by the impressive image of a Samurai warrior. George Lucas, in keeping with the idea that Vader's whole being was to be mysterious, wanted the character to be entirely in black.